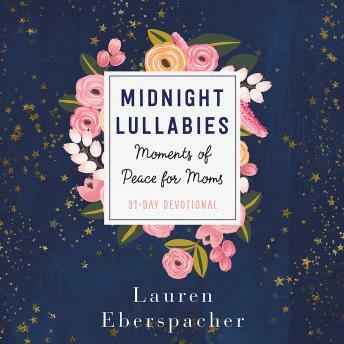 Usher the peace of Jesus back into motherhood with Lauren Eberspacher's 31-day devotional, MIDNIGHT LULLABIES. Often, mothers are told about the joyful, exciting things that they are about to embark on as they enter into parenthood. What people fail to share is the hard seasons of motherhood: loneliness, anxiety, depression, insecurity, comparison, disconnect with the Lord and their husbands, and loss of identity. These seasons can consume their hearts and steal their joy, leaving them hopeless and full of shame. Most mothers hide during this time, thinking that they are alone or that something is wrong with them. The simple truth is that having children changes everything. But so does Jesus. His Word can breathe life into every space, and Midnight Lullabies meets the weary mama in the trenches of motherhood while she does Kingdom work within the four walls of her home, shining light and giving hope when it seems most far away. In Midnight Lullabies, over 31 days, Lauren Eberspacher explores those places of motherhood that are often left unspoken. While embarking on her own journey of being a mama, she has encountered seasons that shocked and surprised her. But there is always hope. As a storyteller, Lauren takes the everyday moments and gives biblical insight to the mother facing these hard seasons, giving the reader a sense that they are having a conversation with a friend around a cozy kitchen table. Mothers often just want to hear another mom say she's in it with them. And when Eberspacher addresses these hard issues, she not only says, 'I've been there; I understand,' but she follows it with, 'But God.' Eberspacher shows that Jesus can be found in every moment of motherhood and that His strength and His Word are enough for you.